The Austrian septet Mnozil Brass entertained theatergoers at State Theatre New Jersey on February 22. They began performing together in Vienna in 1992 and haven’t stopped since. Logging over 130 shows a year they travel to many countries and continents, bringing their unique show to many people. Prior to the show, my knowledge of them was limited. I was pleasantly surprised as I watched their uniqueness unfold. They were dressed like misfits each in their own style which included short pants, pants in purple, plaid, crooked bowties, and red socks. They exude chaos. The night consisted of a few of the players doing mime skits with clownish touches as the rest of the ensemble played their brass instruments. 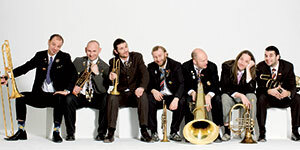 The chaos of their appearances met the beautiful brass music, creating a nice blend of performing arts. They were here, there, and everywhere—all around the stage. In one skit, a few of them tried to play a vinyl record as a few others were playing their instruments, starting then stopping giving the illusion that they were controlling the record player. In another one, they were mixing ingredients, making food with funny undertones. One of the players moved across the stage as if he were a cat with a tail dangling behind. In another scene, one of the actors pretended to be amused every time the other actor turned around to him, but for us, he showed his boredom. One of the musicians played two trumpets at once. All of their farcical skits had us laughing. They have been dubbed the Monty Python of the musical world and they have Viennese schmah which is similar to sarcastic charm. Schmah doesn’t have an equivalent English word which added to the mystery of these players. Armed with tubas, trumpets, and trombones they played some classical and jazz pieces. Starting out softly as background music, they would then take it up a few notches whenever the mime acts were coming to a close. All seven of them played together for a few pieces, pumping out some strong brass tunes. They won the prestigious Salzburger Stier Cabaret Prize and were nominated for the Amadeus Austrian Music Award. Dressed like the police officer of the Village People, one of the actors segued into singing "YMCA." We all sang along because doesn’t everybody know that song? They also sang a song in what sounded like French. Aside from these two songs, the remaining vocals consisted of mumbled words. In this style, emotions and body language coupled with music have the upper hand because it’s the only way they can convey the story to the audience. These players have been together for a long time. Their mastery of blending acting and brass music is chaotic, but then it comes together making it an inspiring experience for the viewer. Nietzche’s quotes came to my mind when thinking of chaos: “Out of chaos comes order,” and “One must still have chaos in oneself to be able to give birth to a dancing star,” apropos for these talented performers. 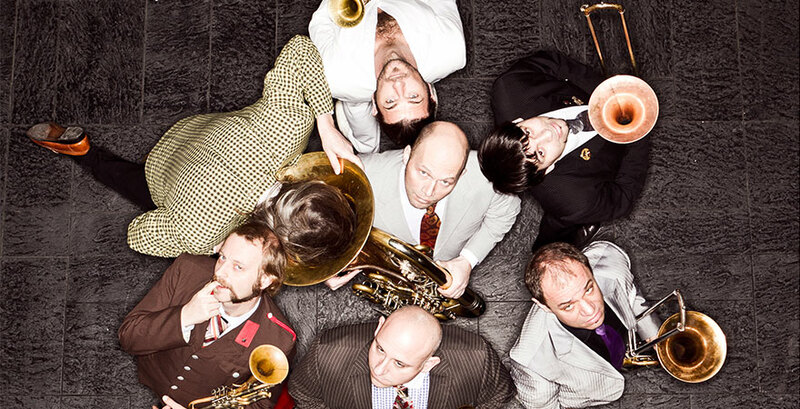 Step Right Up to the Circus with Mnozil Brass!